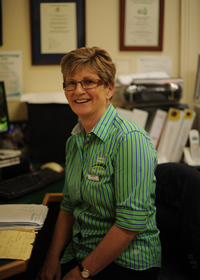 Barbara has worked at the clinic since 1992 as a receptionist/ book keeper. She spent the previous 10 years working in a medical practice in Sydney. Coming from a family of doctors and vets, it is little wonder that she ended up working in this field. She enjoys the challenge of organising a busy mixed practice but in particular enjoys the daily interaction with friendly, regular clients. Outside of work, Barbara enjoys walking. She also enjoys spending time with her 3 children and 8 grandchildren.